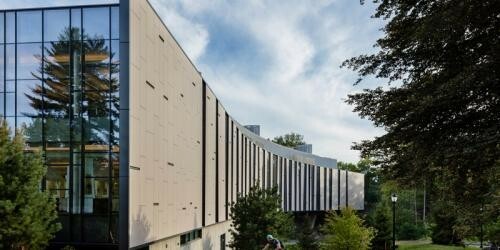 The new Bridge for Laboratory Sciences redefines the sciences at Vassar. 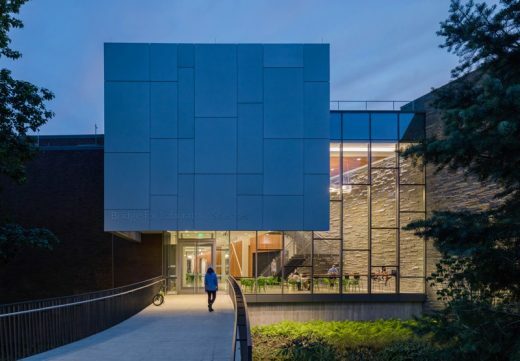 The building is both literally and figuratively a transformative connector ‒ bridging the disciplines of science and the surrounding wetland, while built like a bridge for minimal impact on the environment. The building reflects Vassar’s commitment to science, research and environmental advocacy, as well as the symbiotic relationship between scientists, students, and the landscape in which they work. Consistent with the existing scale of the campus, the new two-story building is intimate and inviting. 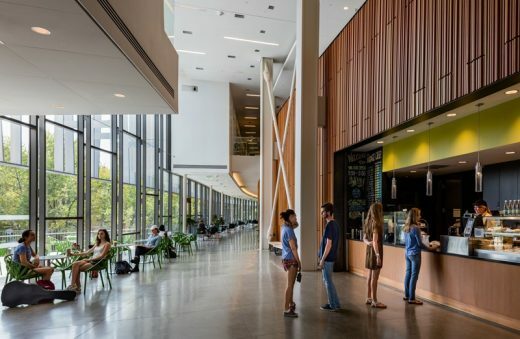 The curve of the building minimizes the external impact of its size on its context, while its curved interior passageway creates a central corridor for student activity with panoramic views out to the natural landscape below. 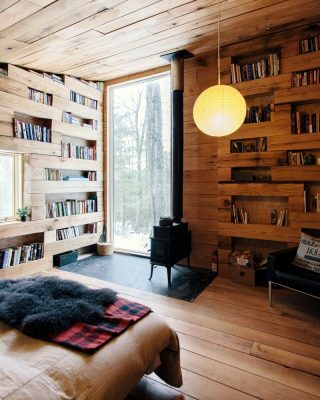 This experience of a “building in the trees” inspired the tree pattern of the building’s façade. Acknowledging the wetland corridor as an avian flight path, Vassar is at the cutting-edge of bird-friendly design. The Bridge for Laboratory Sciences incorporates a number of innovative façade design features to minimize bird collisions, including Ornilux, a coating and pattern nearly invisible to humans yet highly visible to birds, and custom pattern ceramic frit inspired by the surrounding tress and designed for maximum legibility for birds in changing light conditions. The project received a Pilot LEED Point for bird-friendly glass and was the first specification of Ornilux in the US. 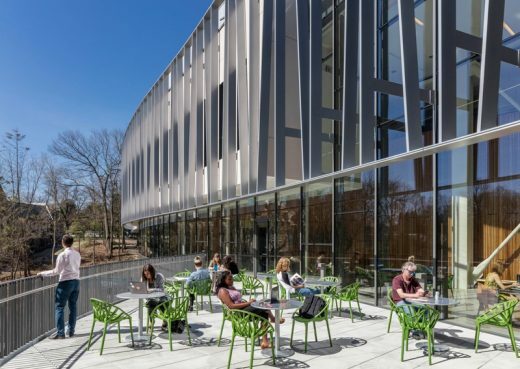 The building reflects Vassar’s goal to expose undergraduate students to the sciences and facilitate cross-disciplinary collaboration by keeping the sciences in view and drawing students in with appealing spaces like the café, the outdoor terrace, classrooms, informal seating and studying spaces. Design throughout the VBLS breaks down the old divide between classroom and lab and features many new integrated scientific spaces where instruction, experimentation and discovery can be fluidly accomplished. 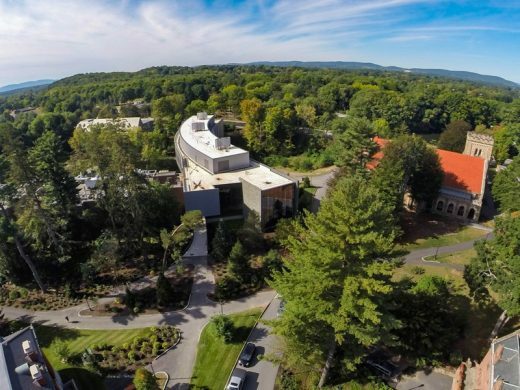 A living laboratory, the building is a reflection of Vassar’s history of science, research and environmental advocacy, and of the symbiotic relationship between the scientists and the landscape in which they study.